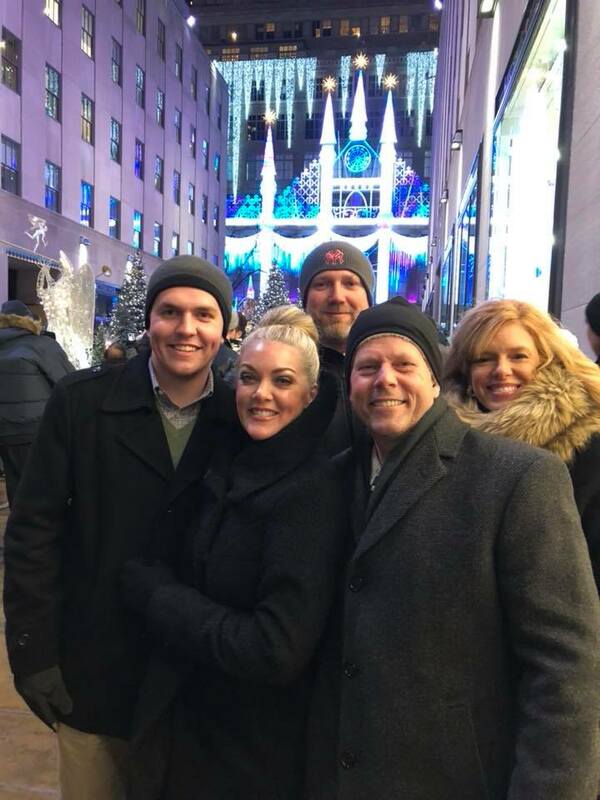 Three weeks ago, I reported that three freshmen GOP state representatives went on junket to NYC in December paid for by a National Popular Vote lobbying group. I've learned some news on the topic that deserves an update. The Institute for Research on Presidential Elections put on the December 14th-17th excursion, which was attended by State Reps. Avery Frix (R-Muskogee), Rhonda Baker (R-Yukon), and Kevin McDugle (R-Broken Arrow). IRPE and its sister organization National Popular Vote seek to bypass the Electoral College and elect the president by a national popular vote. 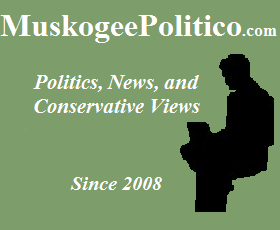 Under their proposal, states would pledge to give their electors to the winner of the popular vote; hence, Oklahoma's electoral votes would have been given to Hillary Clinton in 2016, and to Barack Obama in 2008 and 2012, despite Oklahomans overwhelmingly voting for the GOP nominees. 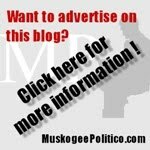 On February 3rd, the El Reno Tribune ran an article on the topic, interviewing Rep. Baker (who has not responded to my repeated requests for comment) and State Sen. Lonnie Paxton. 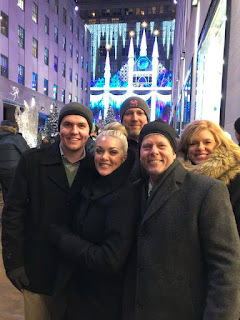 Baker told the reporter that her expenses were indeed paid for by IRPE, but that she personally covered expenses for her husband, who also attended the trip with Frix and McDugle. She is quoted as saying, "It's all on the state Ethics Commission website." 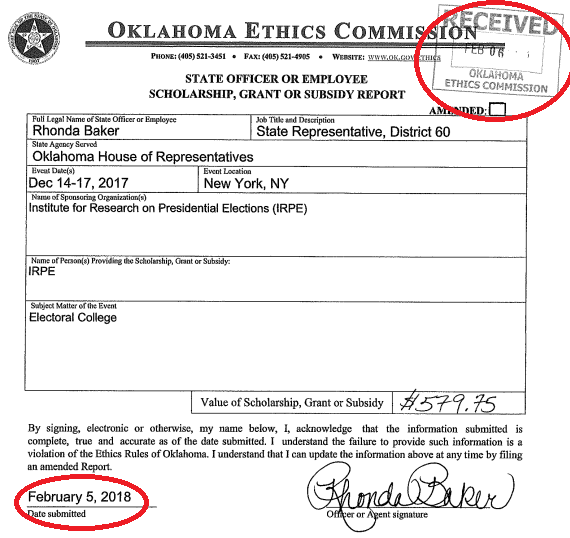 Problem -- there is evidence that she had not submitted the require disclosure at the time of the interview, despite giving the impression to the El Reno Tribune (and thus her constituents) that she had. 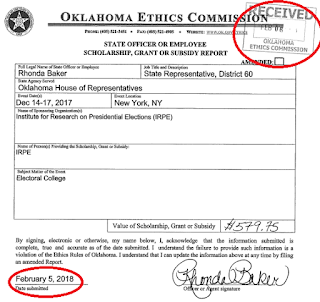 Filings with the Oklahoma Ethics Commission show that Baker submitted the disclosure form on February 5th, and it was stamped "received" on the 6th - two days after she told the El Reno Tribune it was "all on the state Ethics Commission website". 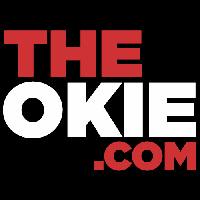 According to Ashley Kemp, Executive Director of the Oklahoma Ethics Commission, legislators and state employees who receive scholarships or subsidies for trips to events like this must submit a disclosure form within 30 days of the trip, showing who paid for their expenses and how much was spent. The "due date" for Baker, Frix, and McDugle would be January 17th. Frix filed his on the 16th, within that timeframe. According to Kemp, failure to follow the Ethics rules in this regard may result in a $1,000 fine. Thus, Rep. Baker was 19 days late filing her disclosure form. To date, Rep. Kevin McDugle has not submitted his disclosure form, and he has not responded to my repeated requests for comment. 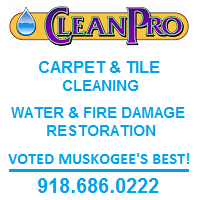 In the El Reno Tribune article, Baker said that other Canadian County legislators 'have also been the guests at IRPE events. Rep. Leslie Osborn and Sen. Stephanie Bice have attended conferences hosted by the organization, she said.' In the same article, State Sen. Lonnie Paxton (R-Tuttle) revealed that he attended a similar event recently in Utah. This is news, as there are no disclosure forms filed or campaign finance reports that indicate Bice, Osborn, or Paxton received the same sponsorships that IRPE is known to give out. Are there other legislators out there who have recently been to National Popular Vote/IRPE events, and had their expenses paid for by those lobbying groups? Who else is not in compliance with these transparency and disclosure rules? I'll keep digging to find out more. 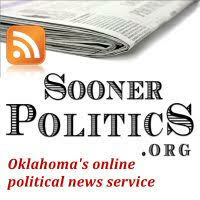 OCPA column: Too Much State Revenue?